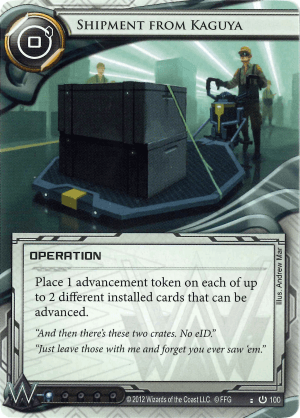 Place 1 advancement token on each of up to 2 different installed cards that can be advanced. "And then there's these two crates. No eID." "Just leave those with me and forget you ever saw them." Free advancements sounds like a great thing, and indeed - like Shipment from SanSan this is more of an economy card than anything else. It saves money, and also clicks, compressing work down to the benefit of the corp. The drawback comes with having to have two different cards to advance to get the worth out of it. Agenda’s are difficult to use with it, and while there are some assets that can be advanced, it is hard to keep those things on the table long enough to make the free advancement worth it. It really shines with the advanceable ICE however, especially when playing around those types. More often than not there will be more than one piece of ICE that can be advanced on the table in a deck that uses that mechanic, making full use of the card. Advanceable ICE hasn’t really seen its day in the sun yet, and while some uses have been made for them, they haven’t really come out as a strategy to be reckoned with. If/When they do, Shipment from Kaguya will undoubtedly make a bigger splash as part of that strategy.